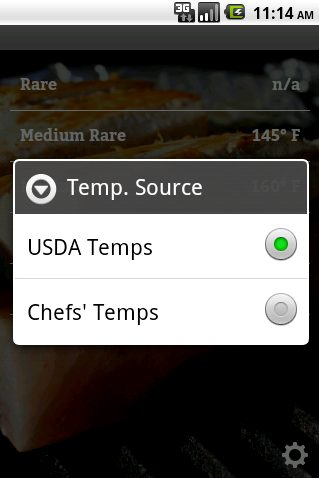 When we left off, we’d built the cooking temperature reference tab. We provided support in our data structure for adding the ability to use USDA or chefs’ (less conservative) cooking temperatures. We just need some UI support. On the TempDetailWindow, we slide up the TableView to make room for a new button, styled with a gear icon. We add support to our artwork/convert_icons.php script to process gear.png similarly to the way we process the stopwatch and thermometer icons that we use on our tabs. 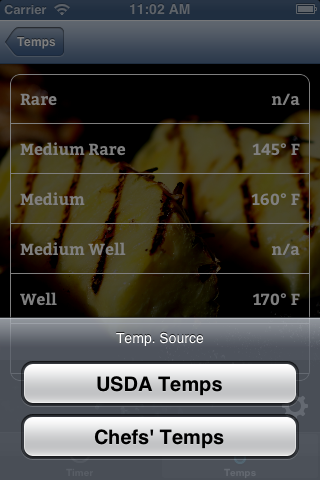 Our load_data() function knows to look at the option_temps_source to determine whether we should show USDA or chefs’ temperatures. Now it’s time to move on to the real meat (pardon the pun) of the application – the timer itself. The objective is to build a multi-stage timer that is easy to set and easy to use while your hands are busy with the grill. If I’m grilling steak, for instance, I might want to grill four minutes, turn, grill four minutes, flip, grill four minutes, turn, grill 4 minutes, then done. I’ve used the timer built into my Samsung android phone, and it’s OK, but at each stage, you have to unlock the phone, reset the timer, and start it up. That can be a lot to mess with when you’re busy turning the cuts of meat on the grill. 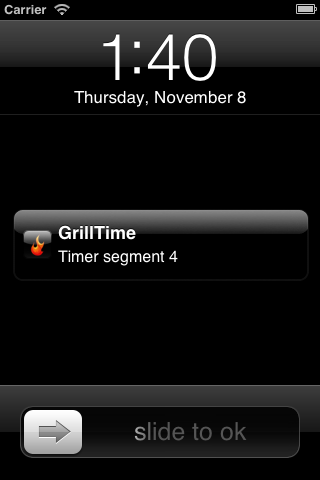 This timer will automatically run for a specified number of segments, alerting at the end of each segment and automatically starting the next segment. First, let’s get into the aesthetics of the app. Sometimes I like to start with that because it’s often the most gratifying part of building an app — seeing pretty visuals. In part 2, I used a semi-opaque layer to screen back the background images. But this really adds more work for the mobile device, which then has to composite the images. It’s not too hard to apply a filter to the images before I packge them in the app, and this will reduce the work done at runtime, and it will simplify our UI code by removing an unnecessary view. I modified convert_backgrounds.php to modify the brightness of the background images. As I started exploring orientation changes, I found that the TitanUp library needed some modifications to better support orientation changes. The problem was that it was retrieving the width and height of the display at initialization. An orientation change did not trigger a refresh of those values. So TitanUp’s TU.Device module now listens to the orientationchange event and updates the displayWidth and displayHeight values as well as physical dimensions. I want to provide a simulated vacuum fluourescent display for my timer. I grabbed some 7-segment display images from the Wikimedia Commons. The 2000×3333 images are in the artwork/digits directory. I used Gimp to alter the images to give the lit segments a blue-green hue. In a real VFD display, you can see traces of the unlit segments. So for a natural look, I kept the unlit segments, but gave them low opacity so that they are not very prominent, and artwork behind them will show through. I attempted to add a glow to the lit segments, but I wasn’t very successful at that. This is where I stop and realize why I’m a software developer, not a graphic artist. But even without the glow, the digits looked pretty good. Now we need to prepare the digits for inclusion in the app. It would be highly inefficient to have the mobile device converting a 2000×3333 digit image to the appropriate size for the platform. So we use convert_digits.php to convert the image down to a more reasonable 400×666. If performance became a big problem, we could provide different versions for different screen densities. But as I found later, this was not a big issue, so I opted to keep it simple with one size of the image for all platforms. 400×666 gives us enough pixels to use on tablets and still have a reasonable resolution. How big will the digits be on the device? We’re going to use a dynamic layout to try to maximize the size so that they’re extremely easy to read. Since our timer window is only doing one thing, it may as well use all the screen real estate it can to display the UI. On a Motorola Xoom (an HDPI tablet display), these amount to 179 pixels for portrait, and 183 for landscape. So our 400-pixel image is more than large enough to display on a tablet without upscaling. Even if the device had double the resolution, we would still have enough pixels to work with. Three buttons are created for play, pause, and reset. Each is enabled/disabled in specific situations. To add to the look of the VFD display, the buttons use simple blue-green icons with alpha transparency as background images. 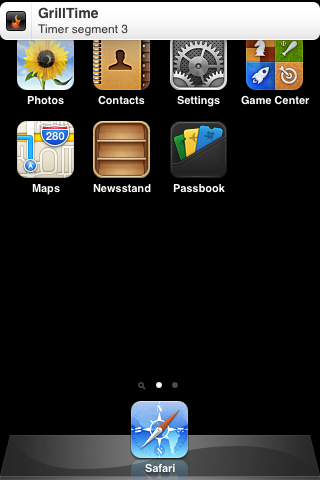 If you open one of these images (for example, play.png), you’ll notice a lot of padding around the icon. This lets us make a button that is large enough to easily click. In the interest of keeping the display free of clutter, I decided to make the adjustment of the timer be gesture-driven. 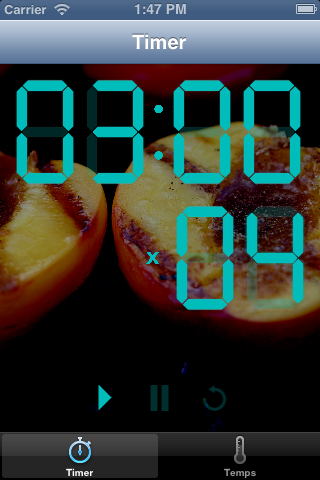 When the timer is reset, the user can touch a digit and drag up or down on it to increase or decrease the value. This allows the user to set the length of each timer segment and set the number of segments. These adjustments can only be made while the timer is initialized (to prevent an accidental change while the timer is running). We attach event listeners to the touchstart and touchmove events of the views that hold the VFD digit ImageViews. If you take a look at onTimeTouchMove(), you will see that we compute the change in value by comparing the distance dragged to the height of the VFD digits. We increment the value once for every 25% of the VFD height the user drags. Here’s where I lost a few weeks of my life (keep in mind I do this in my spare time, so we’re probably talking about 30-40 hours of experimentation to get this all working). 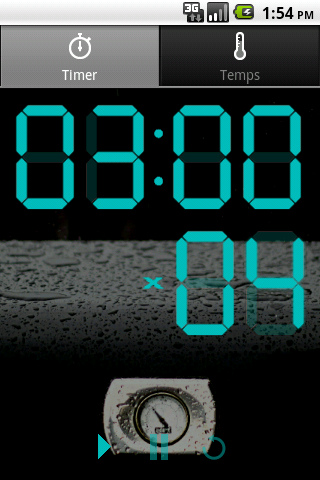 Getting a basic countdown to work while the app is running in the foreground is no big deal. I just use setInterval() to trigger a function every 100 ms. In that function, we compute the time remaining, and then we set the digit images (only changing the images that have changed, because it would be too computationally expensive to change out all 6 ImageViews’ images 10 times per second!). When the time remaining on a segment hits zero, we advance to the next segment and we play a sound (my final solution doesn’t play a sound, for reasons we’ll discuss shortly). This code works wonderfully if the device remains on and your app remains in the foreground. But since we intend for this timer to run for minutes at a time (possibly hours), there’s very little chance that the device will remain on and the app will be in the foreground the entire time. In any of these situations, we cannot guarantee that our app keeps running, so we can’t guarantee that we can sound an alert at the end of a timer segment! We’re going to need to do more to make our timer robust. The solution we choose depends on the platform. In Titanium Mobile, we use Ti.App.iOS.LocalNotification to set up and schedule a local notification. Here are a couple of things that I learned while experimenting with local notifications on iOS. Needless to say, these behaviors required a bit of code-around. We have to manually play the sound if we’re in the foreground when the notification fires. And we have to be smart enough to not play the sound if the notification event is firing due to a notification occurring while our app was in the background. GOTCHA: Notification sounds do not work on the iOS simulator. They do work on a physical device. I wasted a lot of time trying to figure out why my sounds weren’t playing. I even tried converting my .mp3 files to .caf files (you don’t need to do that). All this said, working with local notifications on iOS to build a persistent timer was a piece of cake compared to solving the same problem on android. The Titanium guides even have a section on how you can use a service to schedule future notifications. It’s nice and all, but it just doesn’t work. I take that back. It works great if your phone never goes to sleep. But how realistic is that for our app? Really, how realistic is that for any app that needs to schedule future notifications? Unless by “future” you mean “a second or two in the future”. Neither approach worked. Either way, the service will stop at some point after the screen goes to sleep. Appcelerator support told me that I needed a WAKE_LOCK, but I’m not sure you can obtain one via the core API. I had to look beyond the Titanium Mobile core to a third-party module by Ben Bahrenburg: benCoding.AlarmManager. This module exposes the native android AlarmManager interface. Android distinguishes between a notification, which is simply the presentation of information in the notification area of the device, and an alarm, which is a scheduled action that can happen at some specified future time, regardless of whether your app is running at the time or not. Using AlarmManager is the only way to get android to reliably alert the user at a future time. benCoding.AlarmManager is a nicely built, well-documented module. But it wasn’t quite right for my application. It only allows the developer to schedule an alarm with granularity down to 1 minute. Very nice for making an alarm clock to wake up in the morning, but not so good when you want to make sure that you grill that nice steak for exactly 6 minutes per side! Luckily, the problem was fairly easily solved. I forked Ben’s project and created a version with an additional parameter, allowing me to specify the alarm time in seconds from the current time. Some of the work I did with services in my first attempts to use the future notification technique paid off, as I ended up using an “AlarmService”, which at a specified time, will launch a service that I define. Don’t be tempted to omit the interval parameter, as you may encounter a NullPointerException. In testing, the alarms are very reliable, even when the intervals are long. GOTCHA: Titanium has a bug with respect to android notifications; custom sounds will not play (see JIRA issue). 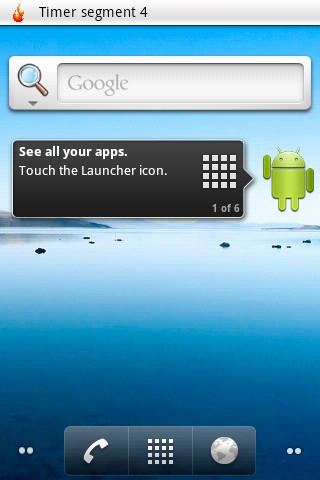 In my app, I work around this by explicitly playing the sound before calling Ti.Android.NotificationManager.notify(). At this point, we have a working timer on iOS and android. The UI is nearly identical on the two platforms. It’s what we all dream of as mobile developers: a cross-platform app with 100% feature parity built with a single codebase. when a notification fires from an alarm-driven service on android, the screen does not wake up. It might be nice to have that one extra visual cue. the sound volume is driven by android’s media volume setting. Unfortunately, while the app is running, the hardware volume buttons control the ringer volume, not not the media volume. 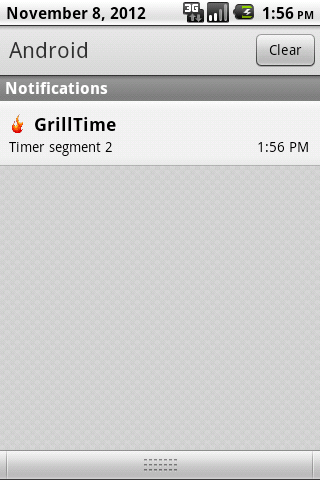 So to adjust the volume for GrillTime, you have to open another app, like a music player. Not exactly convenient. the sound is not very loud on either platform — actually, that’s my fault, as I got tired of the first obnoxious sound I chose, and chose this more subtle alert sound. Ideally, we should probably allow the user to select from multiple sounds. the sound plays only once, which might not be enough to get the user’s attention. That could be solved pretty easily on android, since we play the sound explicitly in the code, but would be harder to solve on iOS. Download the source code here. This includes a binary build of my modified AlarmManager module.